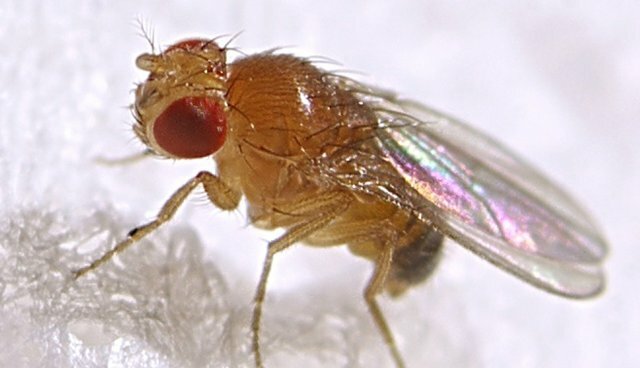 Meet the original barfly: Drosophila melanogaster, or, as they're more commonly known, the fruit fly. These little insects are, thanks to evolutionary adaptations of beer yeast, attracted to the scent of a fresh brew. Brewer's yeast smells the way it does to draw in fruit flies, says a team of Belgian researchers. Yeast cells can't travel very far on their own, so they enlist the help of flies. Like pollinator bees drawn to flowers with bright colors and powerful fragrances, fruit flies disperse the aromatic yeast cells that stick to their hairy legs. It was a fortuitous accident that ultimately lead to the discovery, according to researcher Kevin Verstrepen at the Katholieke Universiteit Leuven in Belgium. Upon returning to his lab over the weekend, Verstrepen discovered fruit flies, escapees from a neighboring genetics lab, had flocked to an open flask filled with yeast. But a flask containing a non-smelling mutant variety of yeast remained untouched. The yeast in the untouched flask were missing a gene, the fungal aroma gene ATF1, which is responsible for the yeast's scent. When the researchers later presented the flies with air smelling of aromatic or unscented yeast, the insects flew toward the fruity-scented microorganisms, the authors write in the journal Cell Reports. "Two seemingly unrelated species, yeasts and flies, have developed an intricate symbiosis based on smell," Verstrepen says in a statement. "The flies can feed on the yeasts, and the yeasts benefit from the movement of the flies." To misquote a misattributed Benjamin Franklin saying: The scent of beer is proof that yeast loves flies and wants them to be happy.